JOHN N VASSOS is known as Businessman and Philanthropist. 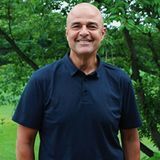 John Vassos is President of CAPX SOLUTIONS LLC. 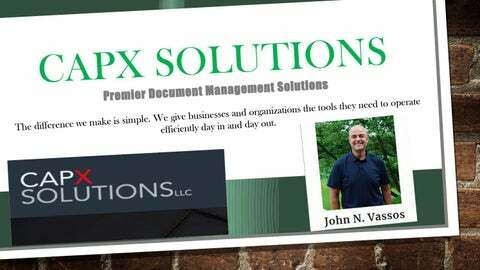 JOHN N VASSOS Company CAPX SOLUTIONS, provide secure content management, Printers, Copiers & more Office Equipments to all accommodate organizations of any size, in any location. As your office needs evolve, our solutions adapt and sync effortlessly with your enterprises requirements. Printer & Copier Support ď&#x192;źCAPX monitors all of your machines remotely, no more taking time to order toner or explain complicated service issues. ď&#x192;źWe work with a dedicated team of cdia+ and pdi+ network professionals who will ensure that your devices are performing flawlessly. Printer & Copier Support ď&#x192;źFor issues that require a physical appearance from a technician, our stated goal is to have you up and running within 4 hours, from the time the initial contact is made. ď&#x192;źCAPX has the ability to provide a team of technicians, dedicated to key accounts, that are available 24 hours a day, 7 days a week, to provide specialized on site support. Streamline Your Company Workflow Today Hardware CAPX is a non-captive provider of all document and content management systems. Put simply; this means we don’t have any obligations, quotas, or incentives to push any one manufacturer’s products. Instead, we prefer to give our clients the printer and copier equipment that has the features that best serve their needs. Streamline Your Company Workflow Today Software Your hardware is only as good as its last update. We keep our clients on the leading edge by ensuring they have access to the latest and greatest in software solutions. Because we have great relationships withÂ industry partners, we are your direct line to emerging technologies at an irresistible price. Experience Providing Office Solutions in any Market Not For Profits Focus on what's important in your mission and we'll handle the rest. Commercial Get access to all the business-accelerating technologies without all the costs. Government Managed print and office solutions for schools, courts & other government entities. Hospitality Printer & copier stress is no longer a mess - focus on your guests and we'll take care of the rest.